Not quite ready to run a race, but still want to be involved? Volunteer! RunWild volunteers take pride in their role within our races. Each of our events require dozens of dedicated volunteers to help ensure runners and spectators get the support they need throughout the day. We are deeply indebted to our volunteers for their commitment and support. There are a wide variety of volunteer opportunities to choose from for every facet of the event. When you sign up to volunteer you can choose the role that interests you the most. Volunteers receive an event t-shirt and are eligible for exclusive volunteer draw prizes. If you are interested in volunteering for Leading Edge Physiotherapy's RunWild please fill out the application form. We would love to have you on board! Package Pick-up: hand out race packages, bibs and t-shirts to race participants. Race Village: Help out at one of our various positions in the race village. This could include helping children in and out of bouncy castles, supervising at the petting zoo, helping set-up stations for face painters or balloon artists and general clean-up of the race village during the event. Water Station: provide hydration to our participants along the route. Course Marshals: Working at positions along the course, ensuring that the course is clear for runners, as well as cheering them on as they run by. Excellent opportunity for gaining volunteer hours needed for graduation. This role is one of the most important roles along the course. Various times available, including very early morning. Pace Zebra: Running at a set pace to help other runners know their approximate speed along the course. 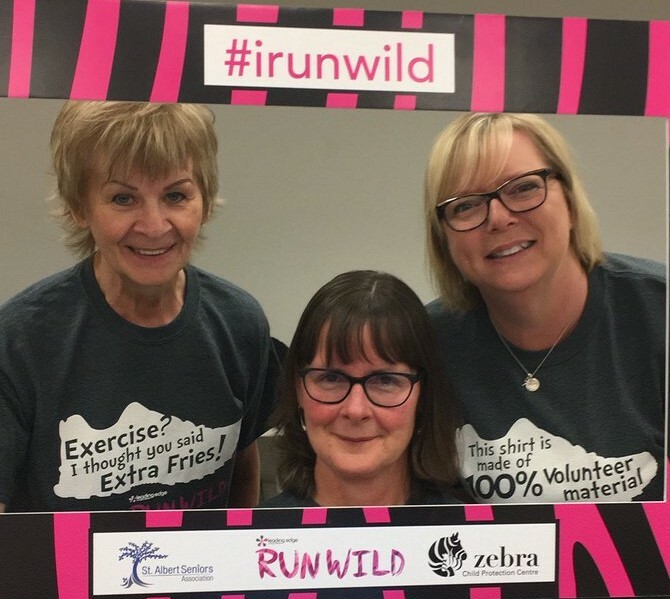 We are looking for pace zebras for the half marathon and 10 K. If interested, please sign up as a volunteer and email volunteer@runwild.ca what pace you would like to run. Lead and Sweep Cyclist: We require a lead cyclist for each race and 2 sweep cyclists for each race. Please note, if you would like to be a cyclist you must be able to bike the entire course. Lead cyclists are expected to stay in front of the first runner in each race. Volunteer Check-In: Check in volunteers as they arrive, provide volunteer t-shirts and direct them to their volunteer station. Maintain a log of safety vests signed out to volunteers. Gear Drop off / Pick-up: Help check in gear from race participants, organize and return gear after the races. Start/Finish Line: Set up the start and finish line for our race participants, ensure they are lined up for the correct races and guide them in the right direction. At the finish line you will help hand out medals, provide water and assist in crowd control. Marafun Support: Helping with Marafun involves placing you along the course to ensure the children stay on course, assist in crowd control, and hand out medals and water. Most importantly, cheer on the participants as they race. Course Logistics: Set up and clean up of directional signs and pylons along the course. This position may require a couple of meetings before the race to ensure you are aware of the course route and your role on race day. Race Village Set-Up: Help set up tents in the race village, set up tables and chairs in the beer gardens and other general set-up for the race. May require heavy lifting. Food Tent: Serve food to participants after the race in our food tent. This may involve some minor food preparation. Clean-up Crew: Responsible for maintaining venue site appearance.